The creators of the original professional Glycolic Acid Peel introduce a in-home treatment peel that is safe, effective and easy-to-use. This high strength two-step peel kit exfoliates and delivers antiaging and skin smoothing benefits, along with improvements in the appearance of pigmentation, fine lines and texture when used as part of an antiaging regimen. Formulated with a potent blend of Alpha Hydroxy Acids (AHAs): Glycolic and Citric Acids. It delivers advanced antiaging benefits to visually improve skin imperfections such as fine lines, wrinkles and uneven pigmentation. • Formulated with AHAs, Glycolic Acid and Citric Acid. • High strength two-step peel delivers noticeable antiaging and skin smoothing benefits. • Visually improves skin imperfections such as fine lines and wrinkles, uneven pigmentation, and blemishes. Targets hyperpigmentation for a clearer, brighter, more refined complexion; Shrinks pores and corrects fine lines. An amino acid with regards to skin care, acts as an antioxidant to build collagen production and can speed wound healing. 1. Cleanse face with a gentle, soap-free cleanser. 2) Apply the Step 1 Peel Pad over the entire face, avoiding eye area, lips and any sensitive areas. Then discard pad. 3) Carefully monitor the skin’s response by observing any redness or degree of discomfort including stinging, burning and itching. 4) Apply the Step 2 Neutralizer Pad over the entire face after 10 minutes or sooner if you experience redness or discomfort. Avoid eyes and lips. Rinse the face thoroughly with water. 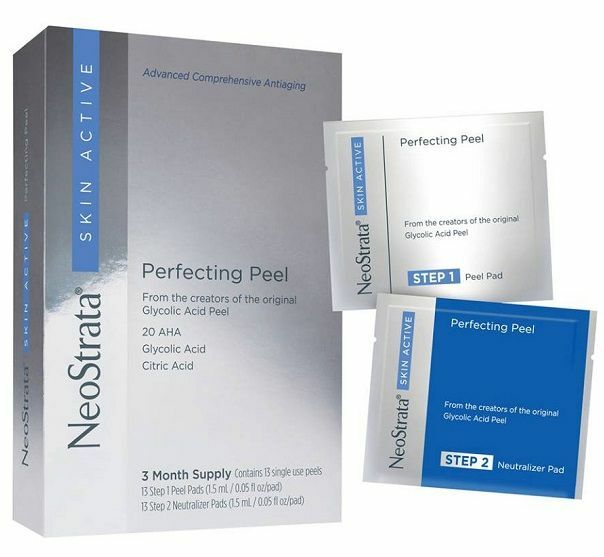 The Perfecting Peel may be used once weekly. Reduce frequency of use if skin becomes irritated. This product can be used in conjunction with a daily regimen of NEOSTRATA® products. Sunburn Alert: This product contains an Alpha Hydroxy Acid (AHA) that may increase your skin's sensitivity to the sun and particularly the possibility of sunburn. Use a sunscreen, wear protective clothing, and limit sun exposure while using this product and for a week afterwards. Step 1 Peel Pad: Aqua (Water), Alcohol Denat., Propylene Glycol, Glycolic Acid, Citric Acid, Arginine, Ammonium Hydroxide. Step 2 Neutralizer Pad: Aqua (Water), Glycerin, Propylene Glycol, Sodium Bicarbonate, Glycine, Benzalkonium Chloride.